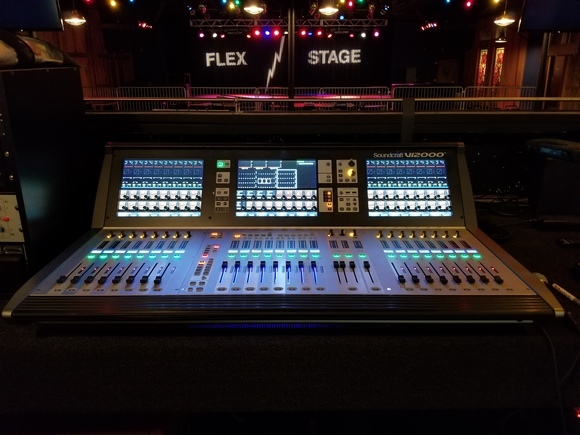 ALEXANDRIA, Va.—Legendary music venue The Birchmere recently collaborated with HARMAN Professional Solutions to upgrade their facility with new Soundcraft Vi Series consoles for events, live performances and more. Established in 1966, The Birchmere is a world-class music venue with a 1,500-person capacity standing-room concert hall and a 500-person capacity seated theater. The Birchmere hosts over 300 performances per year from internationally recognized artists such as Lyle Lovett, Ricky Skaggs, Travis Tritt and more. In order to ensure a more streamlined workflow when integrating with professional touring acts, The Birchmere decided to upgrade the analog consoles in both of their venues to state-of-the-art digital mixing consoles. Together with resident audio advisor Tim Kidwell, they selected two Soundcraft by HARMAN Vi3000 consoles and two Vi2000 consoles. Tim selected Vi3000 digital live sound consoles for front of house position and monitor position in the concert hall for their efficiently designed control surface and Vistonics II™ touchscreen interfaces. The Vi3000 is the only console in its class that can be used by two engineers at the same time, allowing resident FOH engineer Justin Kidwell to quickly and easily assist touring engineers. Vi2000 consoles were deployed in front of house position and monitor position in the theater to run the monitor rigs for their versatile routing options and intuitive interface. Vi2000 consoles combine the unique Vistonics-based control surface with Soundcraft® SpiderCore—a powerful integrated DSP and IO engine for on-board signal processing. The Vi2000 includes a number of useful timesaving tools such as vMIX automatic microphone mixing, BSS DPR901ii Dynamic EQ and Lexicon Multi-effects.